A Transport Ministry spokesperson said it is too soon to know what happened, but ministry engineers were constantly monitoring the concrete slab in question because it was showing signs of aging. Quebec's Transport Ministry says there is no cause for concern after a piece of concrete fell from the Mercier Bridge Saturday, cutting off access to the South Shore for two hours. There was already only one lane open in each direction on the Montreal-bound span due to planned maintenance on the southbound span. 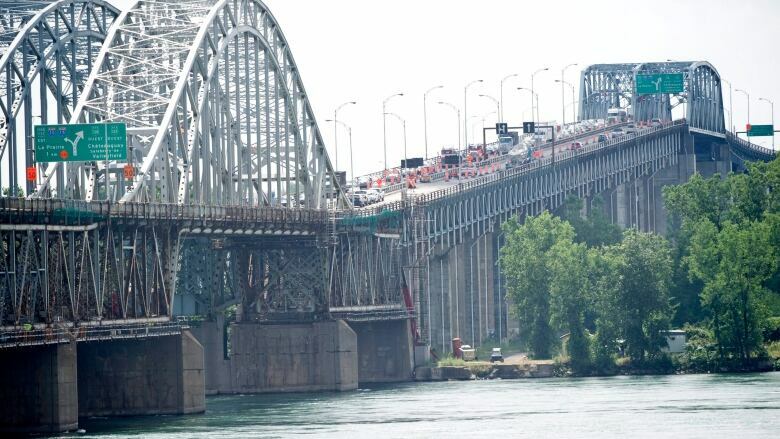 The piece of concrete fell from beneath the Montreal-bound side into the water just before 10 a.m., forcing drivers heading toward the South Shore to be rerouted back into Montreal. The southbound lane was closed during the repairs. The Montreal-bound lane remained open the entire time. MTQ spokesperson Émilie Lord said it is too soon to know what happened, but ministry engineers had been constantly monitoring the concrete slab in question because it was showing signs of aging. "It is important to understand that under no circumstances does this call into question the strength of the Mercier Bridge and the safety of users," she wrote in an email. Built in 1934, the southbound side of the bridge will be closed for repairs every weekend until December. In 2017, the Liberals announced a new structure would be built parallel to the existing southbound span, but a timeline was never officially revealed. Former transport minister André Fortin told the Journal de Montréal earlier this year that the work on the new span would begin in 2023. LaSalle mayor worries residents will be trapped by planned work on Angrignon Blvd.